Video is now available of the LISA2012 Software Art and the Art Establishment Panel (Guggenheim, Oct 16, 2012). The panelists were Amanda McDonald Crowley (curator, formerly Eyebeam), Barbara London (curator, MoMA), Christiane Paul (curator, Whitney) and Marius Watz (artist). Topics included media art history and the role of media art vs. the contemporary art world. Thanks to Isabel Draves and LISA for organizing the conference and asking me to be on the panel. My presentation for Eyeo 2012, discussing the problem of algorithm cliche, as well as some thoughts on the New Aesthetic. The presentation also featured a section titled “Shock & Awe”, consisting of a slideshow of 853 images of work created between 1994 and 2012, timed to a high-BPM Hardstyle soundtrack lasting 4 minutes and 23 seconds. My take on the New Aesthetic? On immediate reflection I’d say “good job” and “go easy on the drones”. But inevitably there is the jaded voice in the back of my head wanting to snarkily ask, “What took you so long?” Not “you” as in the particular group of people who curate and promote the New Aesthetic meme, but “you” as in (Western) society at large, the technology-addicted masses who want their Facebook (MTV, not so much) and smartphone bliss, yet manage to be continually surprised by the not-always-pleasant byproducts of their addiction. There really is no excuse for being technoculture illiterate if you’re under 40 and living in the Western world. You can plead ignorance of the technological specifics, but not of the cultural effects produced by the gadgets and interfaces that have invaded your life. Technology is not something that happens to other people, nor can you escape it by hiding out in “the humanities.” To be human is to be technological. Lacking a ubiquitous and intuitive understanding of the complex interactions between technology and human culture, sources like the New Aesthetic (NA) become golden. NA is an attempt at diagnosis of the most recent mutations of the human condition, a difficult task best attacked obliquely and from the flank, with subtle observations rather than head on with manifestos (which are not very New Aesthetic, by the way). NA is part meme, part techno-ethnography and part Tumblr serendipity. Its art is juxtaposition: If we put this next to that and this other thing, surely a new understanding will emerge. And you know what? It works surprisingly well. Whether that success is the product of brilliant curation or the result of feverishly sign-deciphering minds scanning image after image for clues that might not be there is academic. If it works, it works. The “New” part is deceptive, however. Most of what NA offers up for examination is not all that new. Technologies like machine vision and geo-location are old by most standards. What is new is their integration into our lives to the point where we are bringing them to bed. Smartphone habituees will think nothing of installing a sleep-tracking app and putting their phone on the mattress, where accelerometers will presumably make sage observations about your quality of sleep. This is the new Aesthetic—human behavior augmented by technology as often as it is disrupted. The New Aesthetic is a sign saying “Translation Server Error” rather than “Post Office”. The New Aesthetic is faces glowing ominously as people walk down the street at night staring at their phones—or worse, their iPads. We need NA like we need weather vanes warning us of oncoming storms, because tech-driven cultural innovation has a nasty habit of becoming an inevitability with little regard for personal preference or even legal precedence. Once conceived of, or even just scribbled on a napkin during a drunken startup crawl, it is as though they might as well always have existed. Yes, GPS will come storming out of the wilderness survival gear catalogue and give your mother an incredibly increased action radius. Yes, computer GUI elements will sprout legs and appear lounging around your neighborhood as though they had always been there. Yes, digital glitch is as much of a cultural artifact as the graininess of film or the bad colors of Polaroids. And that guy on the corner with the World of Warcraft battleaxe replica 1 instantly looks at home from the moment that he appears. Yes, you think, now that I see it, it makes perfect sense. 1 That would be the artist Aram Bartholl, performing his “1H” intervention. Announcing Generator.x 3.0: From Code to Atoms, a workshop and exhibition focusing on digital fabrication and generative systems. This event is an evolution of Generator.x 2.0: Beyond the Screen, which took place in Berlin during Club Transmediale 2008. Generator.x 3.0 is produced by iMAL in collaboration with Marius Watz. Context: Digital fabrication drastically changes manufacturing by democratizing access to industrial tools as well as changing the way objects are produced, opening the door for the on-demand creation of bespoke objects. Combined with the “craft” of code it becomes possible to directly connect parametric software processes to an instant manufacturing workflow, turning bits into atoms and introducing a paradigm that is radically different from traditional 3D modeling. Generative systems shift the focus from static models towards a computational logic – what Bruce Sterling calls processuality. Here objects are understood as mere instances of a family of forms, produced by a specific interaction of parameters. Such forms may be data-driven or created through interactive means, adapting to conditions coded into the system. The artist becomes a “gardener” of possible forms, harvesting desirable results in an iterative process of coding and prototyping. Workshop format: Participants will be chosen from a call for projects, with a focus on experience combining coding practices with digital fabrication. We will have large and powerful laser cutter machine on site, as well as several low-cost 3D Printers (Makerbots). The main software tool will be Processing (http://www.processing.org), but we also welcome users of other coding tools like VVVV, PD or OpenFrameworks. The workshop will be hands-on and geared towards producing projects ready for exhibition at the end of the project. Participants will be expected to be familiar with code and generative strategies. There will be short tutorials demonstrating certain techniques, but the main focus is on the participants’ own independent work. Call for projects: Submit projects or concepts for consideration through the online form on the iMAL web site. Support: Generator.x 3.0 is produced by iMAL, and is made possible by the support of the Brussels-Capital Region, the Wallonia-Brussels Federation, and our sponsors Hackable-devices (Paris and Ghent) and i.materialise. Lecture about the rise of digital fabrication and parametric design, looking at their implications for creative practices. 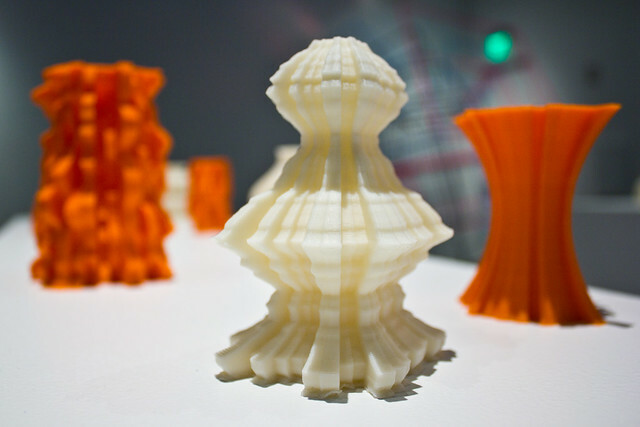 Specifically, Open Source design (Makerbot and Thingiverse), generative systems and data sculpture. I gave a talk at the Eyeo Festival 2011 entitled “Thoughts on Code and Form”. In it I try to establish an art historical context for generative and procedural art as well as articulate a possible new way of understanding these practices. Below is a video of the lecture as well as a PDF with my slides. My thanks to the Eyeo organizers for taping the talk.